For regulars to this blog, you know that I love a good children's book on occasion. If we get our kids reading at an early age, it becomes a no brainer that they become readers later on in life. I have a great series that introduces science to kids in a unique and fun way! The Nick and Tesla series by “Science Bob” Pflugfelder and Steve Hockensmith, combines story and science experiments. I've read and reviewed Book 1 already and I look forward to Book 2. Today I welcome Steve Hockensmith of this dynamic science-writing duo on Guiltless Reading. Prizes are up for grabs ... and it's open international, so ... take it away Steve ... and Steve. So when I decided to do this guest post as a Q&A, it was obvious who I should turn to for the Qs. Me! I’m asking myself questions all the time already, right? Plus, the post was due the next day, and I couldn’t get anyone else to do it. Q: Hi, Steve! How’s it going? A: Hey, Steve. Not bad. How about for you? Q.: About the same. But we’re not here to talk about me. We’re here to talk about you. Why don’t you tell us about your newest book? A: It’s called Nick and Tesla’s Robot Army Rampage, and it’s the second book in a new middle-grade series I’m doing with “Science Bob” Pflugfelder. It’s about these science-loving 11-year-old twins, Nick and Tesla, who solve mysteries by building cool do-it-yourself gadgets. I come up with the mysteries and do the writing, and Science Bob creates all the doohickeys and supplies directions so readers can build them themselves. Q: So it’s kind of like the Hardy Boys meets MacGyver -- with instructions? A: If one of the Hardy Boys was a girl, sure. Q: Who says one of the Hardy Boys wasn’t a girl? You’ve heard the rumors about Joe Hardy, haven’t you? A: Wait. Are you saying that one of the Hardy Boys was -- ? Q: Hey, see the “Q” when I talk? That means I’m asking the questions here, thank you very much. Q: So why a book for kids? 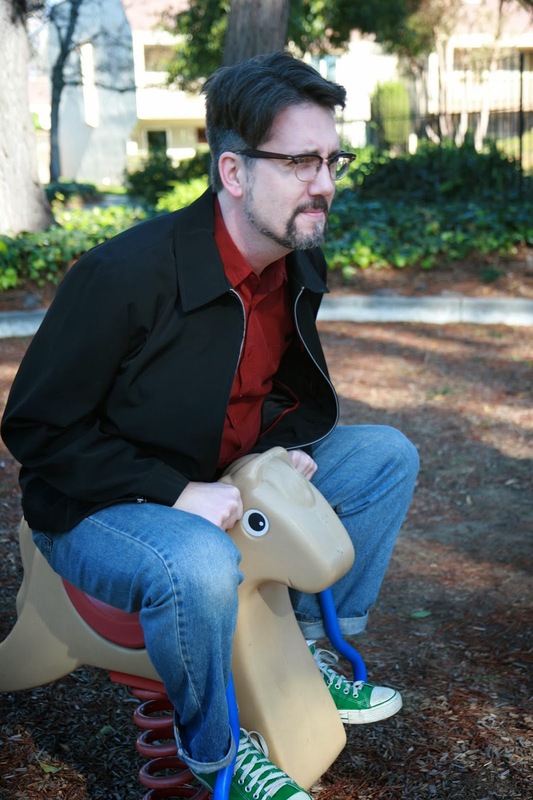 You’ve written seven novels before this, and they were all for adults. Q: [Closes eyes, lets head sag onto chest] Zzzzzzzzzzzzzzzzz. Q: [Opens eyes wide, jerks head up] Huh? What? I must’ve dozed off for a second. What were you saying? Q. [Head droops, eyelids flutter.] Must... keep... eyes... open... but... tedium... too... stronnnnnnng... zzzzzzzzzzzzzzz. A: Geez, you asked the question. I’m sorry if the answer’s boring. What am I supposed to say? The ghost of Donald Sobol came to me in a dream and gave me the idea? Q: Ooo! I like it! Then what happened? A: [Rolls eyes] I should’ve known getting you to do this was a bad idea. Q.: O.K., O.K. If you want to keep it all factual and true and stuff, fine. [Sighs.] 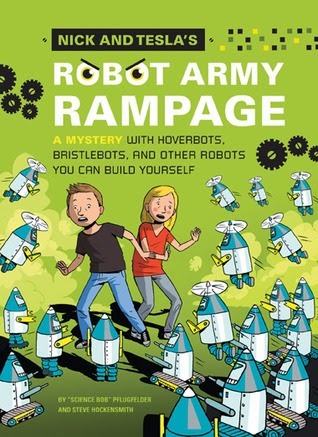 Talk more about the new book, Robot Army Rampage. I understand it’s got rampaging robots in it. An army of them, even. Where did the idea for that come from? A: The title. 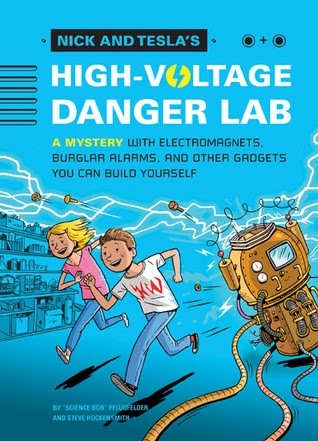 Jason Rekulak, the publisher at Quirk Books, came up with the name for the first book in the series -- Nick and Tesla’s High-Voltage Danger Lab. I thought that was a fantastic title and wanted something just as fun for the first sequel. So I suggested Nick and Tesla’s Robot Army Rampage and then had to cross my fingers and hope that (A) everyone would like it and (B) Science Bob could figure out how to build homemade robots so we could justify the title. And both A and B worked out. A: Are you asleep again? Q: [Gazing off at nothing with glassy-eyed stare] Nope. Comatose. Q: Come back! I was just about to ask you the same thing! Synopsis: Nick and Tesla are bright 11-year-old siblings with a knack for science, electronics, and getting into trouble. When their parents mysteriously vanish, they’re sent to live with their Uncle Newt, a brilliant inventor who engineers top-secret gadgets for a classified government agency. It’s not long before Nick and Tesla are embarking on adventures of their own—engineering all kinds of outrageous MacGyverish contraptions to save their skin: 9-volt burglar alarms, electromagnets, mobile tracking devices, and more. Readers are invited to join in the fun as each story contains instructions and blueprints for five different projects. 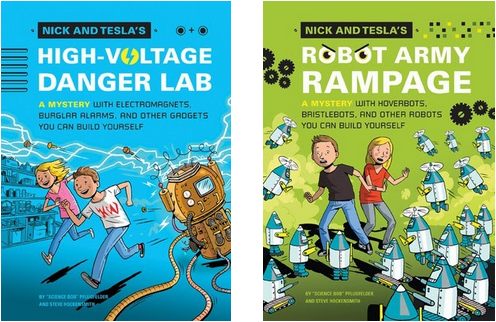 In Nick and Tesla’s High-Voltage Danger Lab, we meet the characters and learn how to make everything from rocket launchers to soda-powered vehicles. Synopsis: In this second novel of the Nick and Tesla series, the precocious brother-and-sister duo find themselves solving another baffling mystery. As the story opens, their Uncle Newt takes a consulting gig at a cut-rate amusement park, engineering animatronic figures for a cheap Hall of Presidentsknockoff. One perk of the job is that Nick and Tesla have unlimited access to the amusement park all summer long—but the kids quickly discover that one of the park employees has a sinister plan. They’ll have to build a few robots of their own to foil him! Readers are invited to join in the fun as each story contains instructions and blueprints for five different projects. I know that it is old school but, I just love it when you mix baking soda and vinegar in a soda bottle and watch the balloon fill up with carbon dioxide gas. Old school is cool. There's a variation of that in book 1 ... :) Thanks for joining in the fun! Love turning a boiled egg into a rubber bouncing "ball" with vinegar - so fun! rubber eggs? i've heard of it but never yet tried it! PS thanks for pointing it out. i think it works now! would love to review these! How about a magic trick gone wrong? I have more of those stories. Does anyone remember those science experiment kits Radio Shack used to sell? I performed some neat experiments with those. I wish you'd share one of your experiments (gone wrong). I'm not familiar with the kits from Radio Shack so now I'm curious! I too enjoy reading children's books. It brings back fond memories and keeps my mind young. I always liked to blow up the ballons and cover them in plaster. Messy but loved the smell:) These sound delightful. Very fun and entertaining interview. What's this I hear about one of the Hardy's being a girl?? That was just Other Steve being perverse. Ignore him. I'm not making it up. Joe Hardy now lives in Baltimore under the name Josephine Hardy. Nothing like a mentos and soda bottle experiment. Love the interview done here, and the books sound awesome. I love books for kids that have an entertaining story and give something to learn as well. If I'm lucky enough to win, I will definitely be sharing the fun with my 12 yr old home-schooled daughter. Fun stuff! Good science experiments - plan proceeding to take over the world (maybe I should have said that ;) ). I love Mr. Hokensmith's interview with Mr. Hockensmith. I'm glad you enjoyed the Q&A! I don't know if it was an experiment but we had a kit that was supposed to help us make our own sour candy. It was awful!